A MAN fuel tanker truck refuels a Challenger 2 Main Battle Tank, during an exercise at British Army Training Unit Suffield (BATUS). 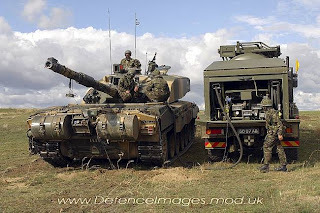 BATUS is located in Alberta Canada and is one of the largest training areas the British Army use to exercise their armoured battle groups. It covers an area roughly 7 times the size of Salisbury Plain Training Area.